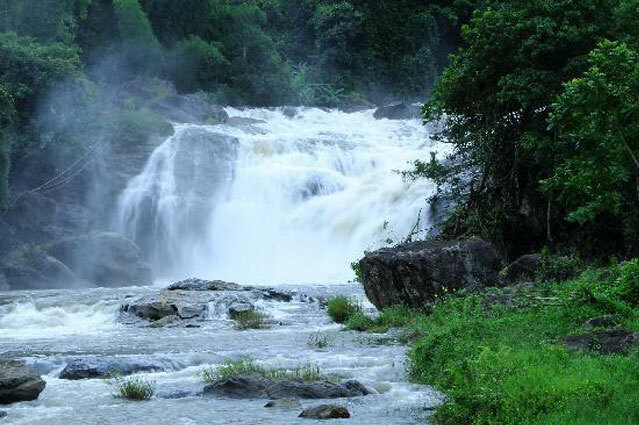 Aruvi waterfall is a beautiful waterfall that is located in the Peppara forest range. In order to reach here, one has to go up to Bonecaud estate which is at a distance of 7 kms from the waterfall. From here, the visitors will be guided by the Kanni tribal men through the mountains. To go to this place one has to seek permission from the forest department. As this waterfall lies between hills and dense forest, the view of the waterfall is breath taking. The area has been isolated and this nature’s beauty is not much disturbed. The crystal clear water cascades down the hill at a height of 4 feet. The weather here is very pleasant and is also an ideal place for trekking. There is a Sage Agasthia’s temple nearby which also attracts the tourists.